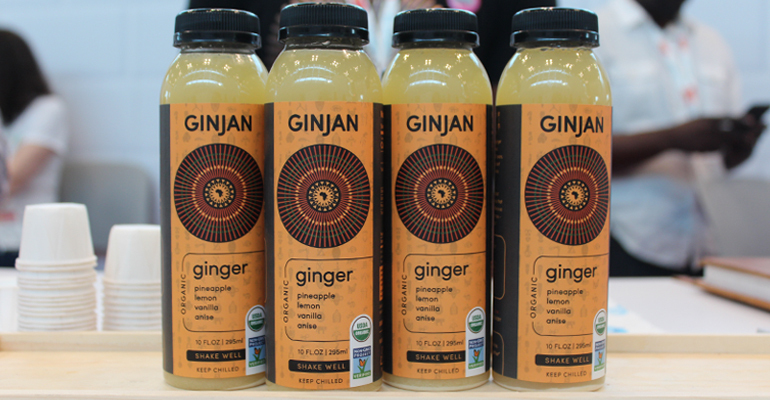 Ginger's culinary, cultural and herbal medicinal roots have planted it as a rising star in the beverage case. Ginger has long stood out as a top seller in candied form. And it's a standard bearer in the supplement aisle for its support of the digestive system and its anti-inflammatory and antioxidant properties. But today's millennials—and others looking at new ways with herbal healing—are packaging up their mothers' medicine. Today's modern offers range from elixirs to teas to bottled beverages with benefits. The multicultural stories impress with ginger's global importance from Africa to Asia to Haiti. Add a dose of convenience for on-the-go consumers and you get products like these spotted at the Summer Fancy Food Show in New York City and Good Food Mercantile in Brooklyn. Ginjan bottles a traditional West African ginger juice that children there drink like American kids drink apple juice. Rahim Diallo decided to bottle the family juice after realizing how few African products make it to the American market. The organic ginger juice refreshingly blends the punch of ginger with filtered water, pineapple and lemon juices, sugar, vanilla extract and anise. Magbè Savané also bottles her mother’s traditional West African recipes, but with the American palate in mind. The Makomas ginger beverages include original, pineapple, beet and turmeric honey. The complete ready-to-drink line also includes baobab, hibiscus and moringa juices. All help fund the Makomas Foundation, which focuses on woman farmers with its sourcing and financially to build a sustainable local economy. Ginger beer abounded at Summer Fancy Food. Credit cocktail culture, if you like, but the drink satiates beyond the bar and finds favor among the those choosing today’s sparkling sippers. With a nod to its ginger beer’s Caribbean sugar roots, Regatta Craft Ginger Beer has garnered recognitions for its “Bermuda stone” style that now comes in original, light (using agave instead of sugar) and zero sugar (with stevia). Lemonade, too, gets a ginger zing, with Lori’s Original Lemonade taking the Specialty Food Association’s Silver Sofi Award in the Cold Beverage—Ready to Drink category. Lori’s “fancy lemonades” were born of her children’s lemonade stand inspiration and perspiration needed when school district budget cuts left her jobless. In addition to Ginger, the line includes Original, Lavender, Lemongrass and Wild Strawberry. A Philly brother triumvirate sampled their brightly packaged and equally bright-tasting ginger tea blends at the Good Food Mercantile in Brooklyn. The brothers grew up warmed and treated with ginger tea by their Haitian parents. They took the habit into their early adult years and decided a convenient blend would make the beverage more accessible for them and those who might not want to brew up the root themselves. Thus was born Dorpare Tea. The "loose-tea" blends are simple: Ginger Lemon, Ginger Raspberry and Ginger Pineapple.